"Gemstone" or "gems" are not scientific terms, but rather collective names for all ornamental stones usually cut and polished for jewelry. The realm of gemstones is very large. Anything that is cut and polished into a stone suitable for jewelry is considered a gemstone. This includes minerals, rocks, organic materials, even meteorites. A common way of classifying gemstones is "precious" or "semi-precious". This really isn't a correct classification as many gemstones that fall in the semi-precious stone category are far rarer or more expensive than precious stones! Precious gemstone generally describes the most valuable stones. These stones are usually transparent, faceted, with a hardness of 8 or higher. This means they are great stones for durability in jewelry. This category includes diamonds and what are known as the colored stones. Well known colored stones are rubies, emeralds, sapphires, etc. It also includes lesser known stones such as tanzanite, tsavorite, and indicolite. There are exceptions of course. Opal is neither transparent, nor faceted, and it has a hardness of 5.5. Natural Pearls are not transparent either, and they are the only stone always left natural, not cut, when set in jewelry. All other gemstones fall under the semi-precious gemstones label. They are usually translucent (some light passes through) or opaque (no light passes through). Semi-precious stones can be minerals, rocks (a conglomerate of several minerals), organic (such as Amber), or even a meteorite. Generally gemstones with a hardness of 7 or lower are considered semi-precious. 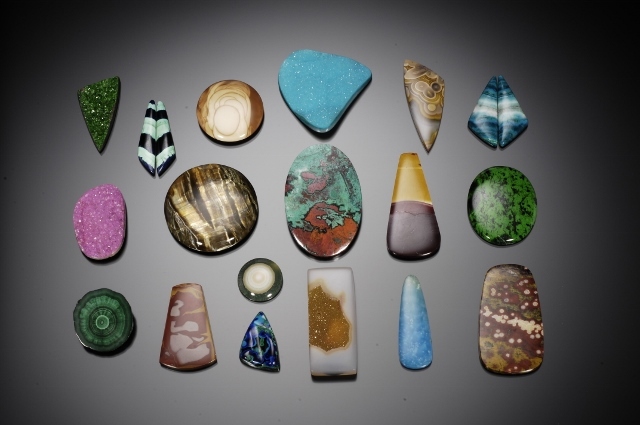 Most semi-precious stones are cut into cabochons instead of facted. There is a huge array of gem stone materials that fall under this category. The copper gemstones: chrysocolla, malachite, azurite and more fall under the semi precious gems category. Turquoise, of course, is probably one of the best known semi-precious gemstones. But there is also Tiger's Eye and Rhodochrosite and common opal, and a whole lot more rarer and sometimes very expensive semi precious gems. Semi precious gemstones can be almost any color: red, black, blue, brown, yellow, even orange. And they come in multi colors too! One very common group of semi-precious gemstones is the chalcedony family, which includes agates and jaspers. See my agate and jasper guide for a more complex description. A vast variety of agate stones and jasper stones are found all over the world in many colors and patterns. The quality of the cutting can play an important part in determining the value of a semi-precious gemstone. The cutter needs to know how to orient the cabochon to its best advantage, and how to get a good glassy polished finish. At BarlowsGems we specilize in rare and unique semi-precious gemstone cabochons. We travel the world looking for striking patterns and bright colors. We personally orientate each gemstone to get the best possible pattern. Each semi-precious stone cabochon is hand cut and polished. Please check out the cabochon stones we have by exploring our store. You can click on a material type to the left or you can search for specific shapes or colors. Make sure to search for the singular (triangle instead of triangles) for your most complete selection!